OK the rear suspension is out of my 72, now what? OK, the rear suspension is out of my 72 and on the floor, now what? 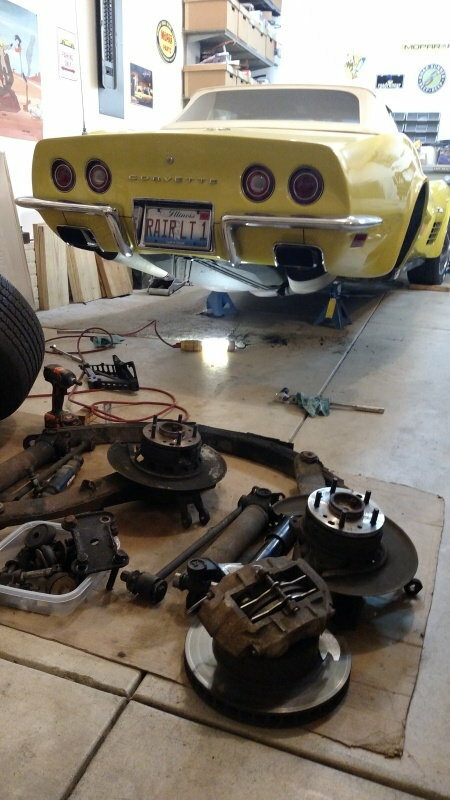 I spent some quality time out in the garage yesterday disassembling the rear suspension of my 72. 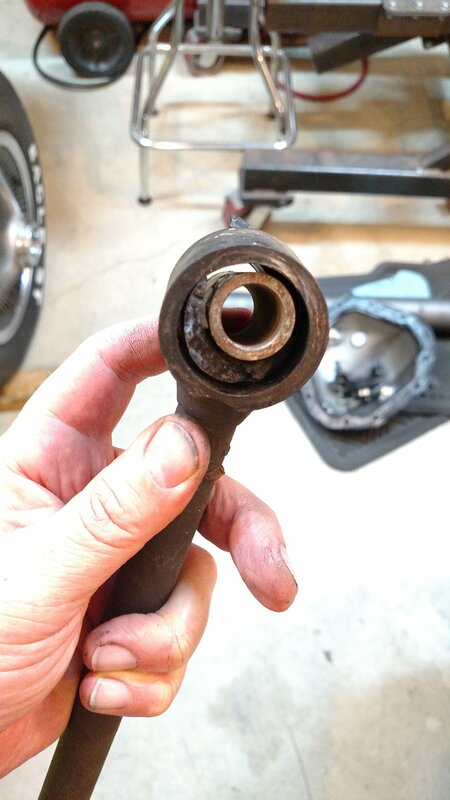 I had noticed that the camber appeared to be greater on one side than the other and I also heard some noise in the rear wheels so after 135,000 miles I decided it was time to go through the rear suspension before anything ugly happened. The disassembly was pretty much a non-event, no sawzall or broken parts and everything came apart fairly easily. What I found was that the rear wheel bearings were in much better shape than I thought, but every rubber bushing was shot - see pic below. My plan is to drop the trailing arms off to Vtech Corvette in Rockford for a rebuild, and clean up everything in preparation for reassembly. I have done some searching here and found a lot of recommendations for strut rod updates, but what about everything else? This is a Survivor car and a driver. I'm not looking to do any autocrossing or drag racing. What would all of you recommend for strut rods, rear spring (I probably need front coils too at this point), shocks, miscellaneous parts I haven't thought of and good vendors? I've owned this car for 20 years but fortunately this is the first major project I've undertaken on it and haven't got a lot of experience with the various Corvette parts suppliers. Last edited by Rair Lt1; 01-19-2016 at 03:12 PM. Did you pull the diff also? If not, check for end play on the yokes. With 135k, I'd be surprised if there isn't some wear on them. Owning a c3 for twenty years with no familiarity with any vendors means you are a blessed man. Long live the 72's. I guess I should clarify, I have a 2007 Mid America catalog here on my desk at work, does that count as familiarity? I have bought parts before from Mid America, Corvette Central, Zip, and Year One when they were still in the Corvette parts business. I'm Very familiar with Mopar cars and parts and can name the vendors that I trust and who to avoid (even though their ads look great). I have been very fortunate that all I've dealt with during my time so far as this vehicles caretaker have been a handful of carb rebuilds and leaking calipers along the normal maintenance stuff and a few minor repairs. Now that I've opened the can of worms that I've been avoiding for a couple of years, I need to go through the rear suspension completely, then the front will sit to low so it'll need to be gone through as well, BTW that exhaust looks a little sketchy while I'm under here, might as well put all new brake lines on while it's apart....you get the idea....My parts budget "allocation" for this car just went up! Last edited by Rair Lt1; 01-19-2016 at 11:36 AM. Time for some hot wings and beer!!! Are you going for repair/replace or restored/ judged quality of the work you are doing? It makes a big difference on who does the work and the parts they use. How about just focusing on the parts that you removed so far? Rebuild the suspension........get some driving time in.......then rebuild the front suspension. The camber thing does make me think you might have a diff yoke issue. I can't comment on how to check them, but mine were trashed and caused some really funky camber issues. I have an extra set of adjustable strut rods that have never been used if you're interested. If you're going to buy a suspension kit, it'll likely come with adjustable rods. That's how I ended up with an extra set. If you're not going to buy a kit and want to upgrade, send me a PM and I'll give you a deal on the ones I have. Last edited by AboveTheLogic; 01-19-2016 at 06:31 PM. Well, to be fair....folks with '79s care. My '72 BB was the best car I ever owned. If the new ones were that good, I'd buy one all over again. Thanks for the replies everyone. Yes it is an LT1 Convertible with A/C but it is also a driver. I have kept almost every part removed/replaced so far (as did the 1st owner) but I'm interested in drivability and reliability more than restoring the car. I'm not looking for any drastic suspension system upgrades or a coil over conversion or anything like that, but I also want the car to drive and ride well and if there are any improvements that can he had since the car was built in 72, I'm interested. So back to the original plan, the Trailing arms will be likely be rebuilt by Vtech, they seem to have a reliable reputation. I met the owner two years ago at MCACN and he seemed to know what he was doing. I'm also going to be in their area next week and can drop them off. Beyond that, I'm hoping for suggestions as to the upgrades I should be thinking about and the ones that are worth the effort. I'm considering a "Grand Touring" set of front and rear springs with KYB shocks and swaybars that I have seen at multiple vendors and adjustable strut rods, although there seem to be a lot of choices there too. Any help selecting the best parts and suggestions will be appreciated! Last edited by Rair Lt1; 01-20-2016 at 09:50 AM. Given your criteria, for what its worth, I agree a spring/shock upgrade is a good way to go. The car can be returned to stock later. Sway bars, adjustable rear strut rods, and a front spreader bar are also non-invasive upgrades that can be un-done later fairly easily. It's too bad you never had the chance to drive your '72 when it was new. You'd know how well these cars drive and handle when the stock parts are functioning the way they were intended. The parts you have don't need to be "upgraded," they need to be renewed. Going back with stock specification suspension parts will give you a car that's virtually perfect for the street. In fact, I really want to caution you about installing higher rate springs and sway bars for the use you've described. Those things are great for the track where the road surface is smooth and well-maintained, but they increase the effects of unsprung weight. Your car might feel better because it doesn't lean quite as much, but in fact, it will handle worse. The suspension will become less compliant, and instead of sticking to an irregular road surface in a turn, the tires will skitter across the tops of the irregularities. That means the car will either have to be driven through turns more slowly, or it will skate off the road. I just want to add that I did a heck of a lot of work on my '72 during the years I had it, and that included the suspension. By far, the best performance on the street was achieved by tuning with tires and shocks, not by changing the factory suspension. I eventually went back to all factory pieces, and you can believe there are more than a few turbo Porches, Panteras and hot shot bikers in Dallas, TX who could attest to the handling and acceleration of that vehicle. Last edited by 454Luvr; 01-20-2016 at 01:35 PM. I'm not opposed to simply replacing the worn bushings and springs with stock components if that will be the best option. In reading about the "GT" spring, shock and swaybar package it was about 420 lb springs, is that much heavier than stock? I'm still going to have the trailing arms rebuilt, and replace the spring and other wear components. Once again this car is a driver and if the best solution is simply Moog replacement bushings that's easy. I just assumed that there had been some advancements or improvements to this system since 1972 that I would be willing to take advantage of since I have it apart and am looking for the best all-around rebuild solution. I'm not familiar with the "front spreader bar" you mentioned. What is that? If you do a google image search for "c3 corvette spreader bar", you'll see lots of examples of them installed in these cars. They seem to be well received by those who have installed them, and they're not very expensive. I installed one when I upgraded my springs and shocks so I can't comment by experience what they do on their own with stock suspension, but others have. I haven't heard an argument AGAINST using one. Even though your car is a very rare desirable piece....I would recommend putting adjustable strut rods on it...from VBP. I would also powder coat the trailing arm while they are out...but that is just me. I like glass monoleaf springs...but several companies make a multileaf touring style spring that looks stock. All bolt-ons of course can be returned back at a later date and are legitimate upgrades to me. Quick Reply: OK the rear suspension is out of my 72, now what?